Fuel prices dropped more than 17 per cent in last three months, bolstered by easing global crude oil prices on signs of rising supply and persistent concerns of weakening global demand. In Delhi, petrol prices fell by 17.26 per cent to Rs 69.55 per litre on Friday, retreating from an all-time high of Rs 84. Since hitting an all-time high of Rs 84.06 on October 3, fuel prices has been on a downward trajectory due to consistent fall in Brent crude prices and appreciation of rupee against US dollar. In the last three-month period, domestic petrol prices have eased by Rs 14-16 a litre in top cities, while diesel prices have come down by Rs 12-13.5 a litre. 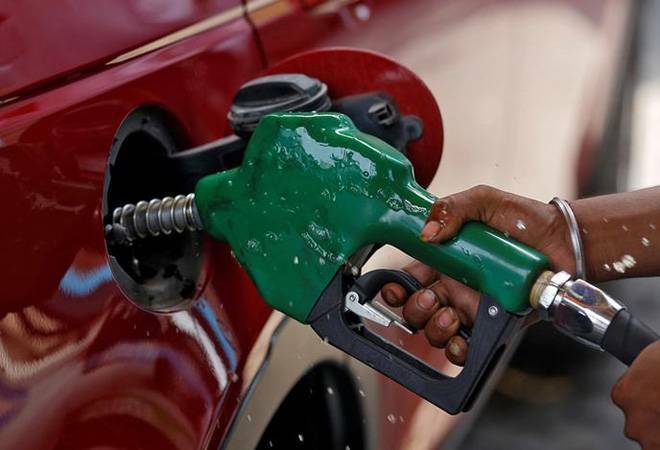 Fuel prices fell on Friday after oil marketing companies (OMCs) announced another cut in petrol and diesel prices across four metros. In Delhi, petrol price fell for the tenth straight day to touch a fresh low of Rs 69.55 per litre and diesel was sold at Rs 63.62. On Thursday, petrol was sold at Rs 69.79 a litre in the national capital and diesel at Rs 63.76 per litre, according to data available on the Indian Oil Corporation website. Similarly, petrol is selling for Rs 75.18 per litre in Mumbai, diesel is available for Rs 66.57. In Kolkata, petrol price is Rs 71.65 and diesel is Rs 65.37 per litre today. Meanwhile, in Chennai too petrol and diesel prices declined to fresh lows of Rs 72.36 and Rs 67.31 respectively on Friday. So far this month, the OMCs have cut petrol prices by around Rs 3.5 a litre while diesel prices by Rs 4 per litre. The price of the fuel varies across the country as states and Union Territories levy their own rate of VAT (value added tax). Earlier in October, the government had reduce the central excise duty levied on petrol and diesel by Rs 1.50 in wake of the skyrocketing Brent oil prices which crossed USD 86 per barrel, the highest in the last four years. According to dynamic pricing mechanism in India, the prices of domestic fuel depend upon international fuel prices on a 15-day average and the value of the rupee. The government had fully deregulated fuel prices in India, allowing the oil marketing companies to sell petrol and diesel below the international rates to shield the common man from the effects of high international prices.